Eight people are dead, and 11 injured, after a truck drove down a bike path in lower Manhattan, according to The New York Times. The driver emerged “screaming,” and was subsequently shot and taken into custody by police officers at the scene, said to be on the West Side Highway bike path on West Street a few blocks north of Chambers Street near the World Trade Center. According to the AP, the driver was carrying two “imitation guns”; witnesses, meanwhile, reported hearing several shots fired, though it wasn’t immediately clear whether those were shots fired by police or the suspect. Eyewitness Eugene Duff, 44, said he saw the white Home Depot truck run down a pair of CitiBike riders as the driver sped along the busy path off the Hudson River. There were visible tire tracks on the bodies of the two victims as the truck continued to carve a path of carnage through the neighborhood, he said. Update, 5:48 p.m.: Video obtained by ABC News appears to show the suspect running through traffic. The New York Times, meanwhile, reported that the driver managed to go 20 blocks on the bike path before crashing and jumping out of the truck. 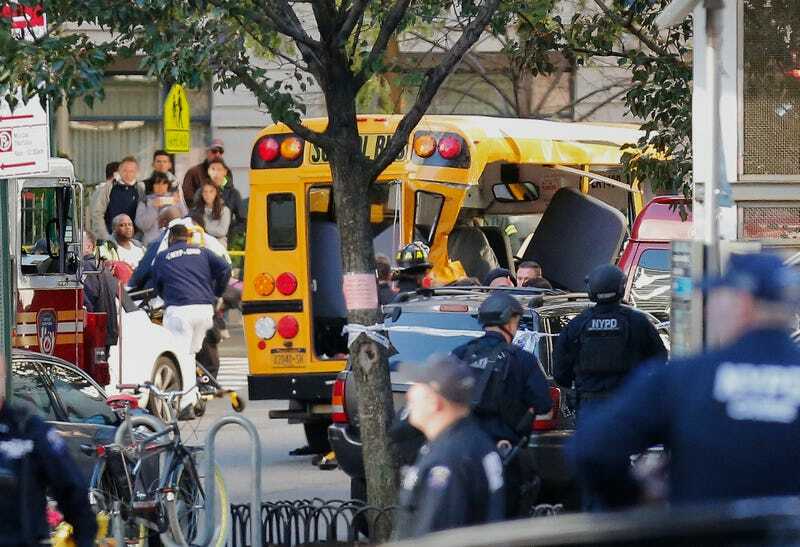 Authorities are treating it as a terror attack, the NYT reported, with federal law enforcement officials taking the lead in the investigation. Update, 8:43 p.m.: Officials have identified the driver as Sayfullo Saipov, 29. Mr. Saipov came to the United States from Uzbekistan in 2010, and had a green card that allowed permanent legal residence. He had apparently lived in Paterson, N.J., and Tampa, Fla. An official said he rented the truck from Home Depot in New Jersey.